We have come a long way learning about ichimoku. In this article about the indicator, I will teach you how to trade forex using ichimoku to anticipate, ride, and profit with the trend. Ichimoku is a trend following system. Because of that, it only make sense to use it and learn it for trend following. I’m not saying that its all the ichimoku indicator could do. It is just the first step to getting to know this indicator. You can use ichimoku on any kind of strategy you want on any timeframe and on any market. I have been using ichimoku as a contrarian trader and not as a trend trader. But all traders new to this indicator should first learn how to trade with ichimoku with trend following. That is my beginning. That should be yours too. The first step to using ichimoku lies in the fact that you should be able to anticipate if a new trend is going to rise. We want the big trends. And we should be able to get on it before it even begins. We want these trends to last for days, months if possible. So how do we anticipate it? From our last post about the lines, we use the tenkan sen, kijun sen and chikou lines to anticipate a trend. If the 3 lines agree that the trend is going bearish, there is a high chance that a reversal is near. When the kijun sen and tenkan sen lines cross, it means a reversal. If after the cross, the tenkan sen is below the kijun sen, it is bearish. Otherwise, it is bullish. Both kijun and tenkan also points down. Which means its strongly bearish. Now, look at our chikou line. Is it above or below the price action? If its below, then it is bearish. Is it below the cloud or above the cloud? 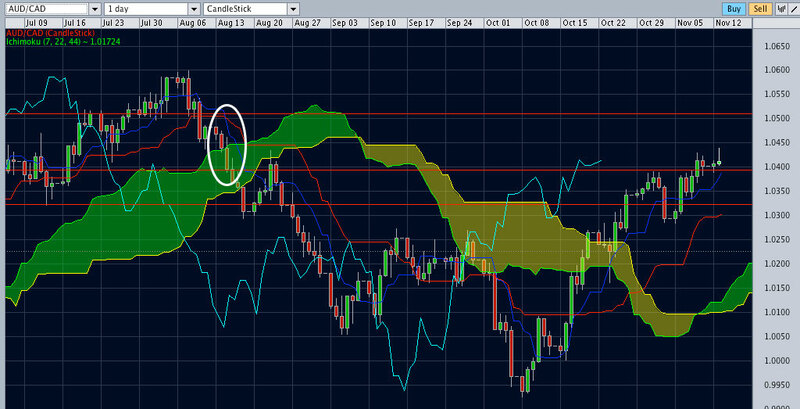 If below the cloud, then it is STRONGLY bearish. 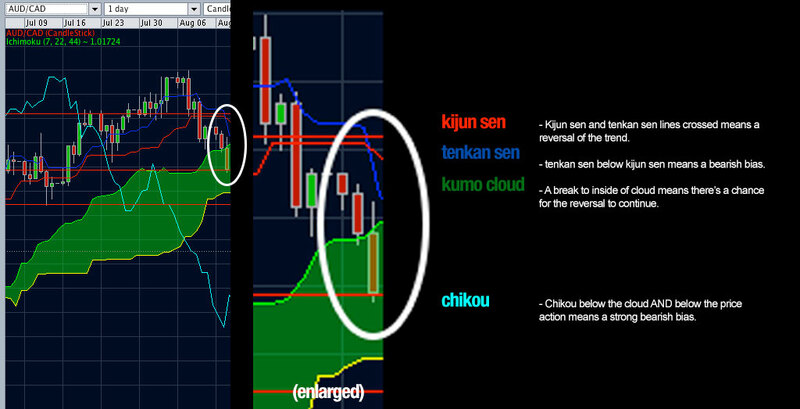 Kumo cloud – price action inside – consolidate (chance of breakout if the price goes down and exit the cloud. Chance of trend continuing up if the price exits the cloud upward). When all the lines agree. There’s a high probability that the trend will go on that direction. Following the indicator, you could have made profit around 300 – 500 pip for one position alone or more if you keep on adding position as the trend go down. The trend went for months going bearish. You could have also anticipated the trend reversing using the same technique you used entering the trade. This is the first step in using the ichimoku indicator for trend following. On our next lesson, I’ll teach you how you can use the indicator to add position as the trend unfolds. Now that you know how to anticipate a trend. Go practice it! Create a demo account or a live account from our list of forex brokers and social trading site. Practice makes perfect. There is no shortcut to success. This entry was posted in How To Trade Ichimoku by ForexPhil. Bookmark the permalink. hi forexPhil, what ichimoku books you can recommend? I’m planning to buy some ichimoku books. I read several costumer reviews in amazon but, majority of their reviews are negative..Thanks a lot in advance. I’ll try to answer your question in future post. Hello. I was wondering on what price exactly should I enter the trade? Can I enter the trade at any price as long as all the indicators agree? Thanks. I’m a newbie and I love reading your blog. Thank you.